To learn a little bit more about this remarkable concept, we visited with our therapy team at Courtyard Manor Nursing Home in Lafayette to see how they utilize the program to benefit patients who have cognitive and behavioral challenges, as well as some who use music as motivation to come to therapy. 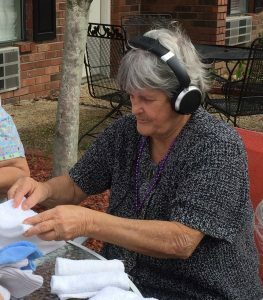 Not only are these devices used during general nursing home activities, but our therapists also actively use music playlists to work with residents. Patients who are affected by cognitive or behavioral issues, as well as those who need encouragement and motivation to attend their therapy sessions, all benefit from the use of music. Come along with us and get to know some of the patients who benefit from this program. Before the Music: Laura has behavioral issues and is visually impaired. She struggles with judgment, reasoning, and impulsivity. Our therapists work often with her to address safety awareness because of her deficits. Now: Once our therapists introduced country and western music to Laura, she became much more subdued during therapy. Some days she prefers to listen to the rosary. While listening to the music, Laura is more socially appropriate and willing to listen to instructions given to her by our therapy team. 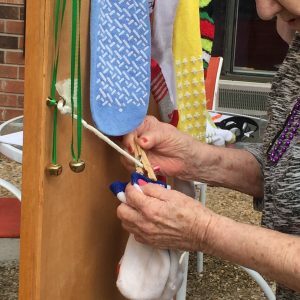 She is able to work on several deficits using the clothes line in order to address standing balance and dynamic reaching in physical therapy; fine motor and visual perception in occupational therapy; cognitive reasoning, safety awareness and matching in speech therapy. Before the Music: Mary Jane moved to Courtyard Manor with her sister. She was living alone and experienced several falls; Mary Jane also suffers with depression. Soon after her last fall, Mary Jane decided she needs to be in a safer environment. Now: Mary Jane is motivated to come to therapy because the music calms her and makes her more socially appropriate. She is able to clear her mind while listening to the music of her choice. This allows her to complete her therapy exercises in a timely manner. Music also helps Mary Jane effectively accomplish activities of daily living, such as folding laundry. Before the Music: Joann had a prior stroke and came to therapy to improve her walking and rising from a seated position, among other deficits. Now: Joann’s goals are much the same as her sister’s. She is motivated to come to therapy because she is able to enjoy her favorite country music. Because of the music, Joann takes instruction from the therapists more readily and is more socially appropriate. Our speech therapist uses worksheets as a tool, which requires Joann to read, comprehend ,and complete instructions in a timely manner. These exercises improve her cognition, memory, and reasoning skills. “Music helps all of our patients in choice-making and achieving functional independence. Many of our behavioral patients have trouble negotiating potential hazards in their surroundings, and they struggle with reasoning. Music helps to calm them and improves focus on the task at hand,” explains Dona Dietlein, Speech Therapist. 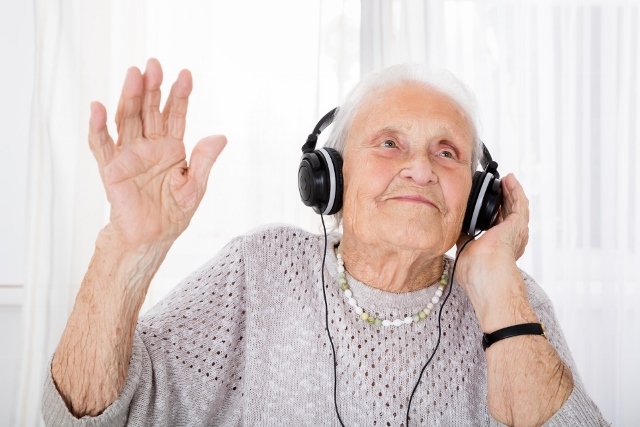 Several of our partner nursing homes are certified Music and Memory facilities. Our therapy teams have expressed interest in earning additional iPods due to the demand from therapy patients and residents. Therapy Center wants to help in this cause but not just for our Music and Memory facilities. We feel that all of our nursing home partners can benefit from this simple, yet highly effective concept. In celebration of 15 years as partner in rehabilitation, Therapy Center is hosting a Giving Back project we call Mind on the Melody. Much like the Music and Memory program we discussed above, we are collecting new and used iPods, headphones and iTunes gift cards to provide to our 30+ partner nursing homes throughout the state. Some of the iPods will be given to homes who already have the Music and Memory program and who need more gear, and others will be given to our therapy teams who plan to utilize the same technique with patients in therapy. 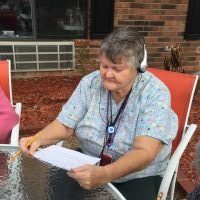 The purpose of this project is to improve the quality of life of nursing home residents who have cognitive and physical challenges by providing them with music during therapy. Collection of these items start on February 20th and will end on March 31st. All donations will stay local. Have questions? contact Kristi Fredieu, Marketing Director, for more information, 337-384-9791. Please visit our website www.therapyctr.com and Facebook page to find out ways to get involved and support our nursing home partners.